A buddy-system that launched in Ferndown last year has been highly commended in the mayor’s Volunteer Awards. Ferndown Community Connectors is headed by PramaLife, the community outreach programme, and helps those in the town who have lost confidence. The ‘connectors’ buddy-up with those who need company to visit new groups or societies. Also supported by Douch Family Funeral Directors that owns A E Jolliffe & Son branch in the town, the group received the prize from mayor Cllr Jean Read. On top of that, the connectors were also nominated for the East Dorset Town Council’s community awards in the Best Community Project, category. Cllr Toni Coombs, Chairman of East Dorset Town Council, presented them with their certificate. And so successful has the group been that it is planning to expand. 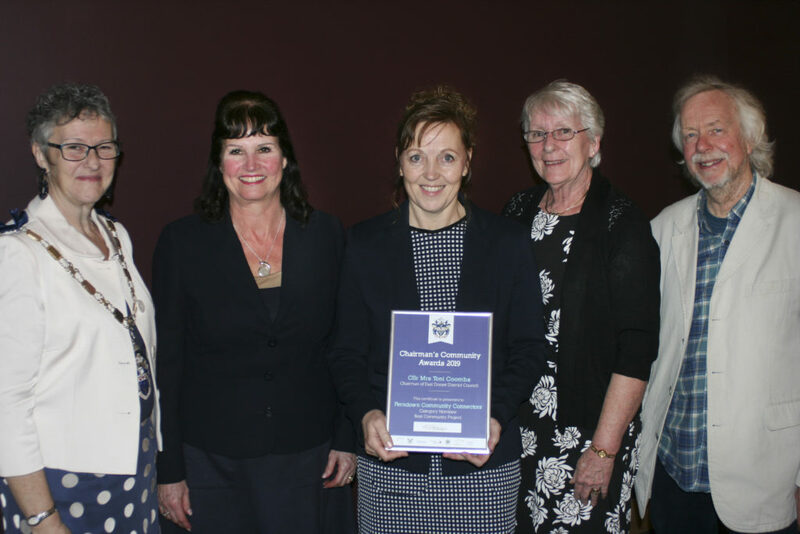 Carol Davies from PramaLife, said: “It was absolutely brilliant to be recognised so shortly after we formed the group. “We have a wonderful bank of buddies who assist people to reconnect back into their community by accompanying them to various clubs and groups, so they are not alone. “Those who are recently bereaved or in need of confidence have found the service very useful.